As a dancer, I was so excited when some of us at Broadway Inbound were invited to a private dance dress rehearsal for Roundabout Theatre Company’s upcoming production of Kiss Me Kate. I’m always interested in seeing how a choreographer can interpret and reinvent a classic musical for a new production. We took our seats in the Roundabout rehearsal room where a few members of the ensemble were already poised to begin. Director Scott Ellis and choreographer Warren Carlyle (who also choreographed the exquisite Hello, Dolly!) greeted us and informed us we would be seeing the number “Too Darn Hot,” and Carlyle would explain the process and the stylistic choices behind it. As the live band started to play first few sultry notes (featuring an incredible clarinet riff), we were all immediately transfixed on ensemble member Phillip Attmore. In today’s rehearsal, he’d be covering two roles, including one that will be played by Corbin Bleu in the show. Attmore did not disappoint, and all eyes were drawn to his outstanding performance as a dancer and singer. The eight or so lithe performers ran through most of the number, and we erupted with applause when they were done. Except they weren’t done! Carlyle then told us he wanted to walk us through a few different sections of the number, showing us his process and why some moves didn’t make the final cut. He wanted to both tell the story of the song and make it visually cohesive for the audience. He talked about how he created the “vocabulary” of the number—boys versus girls, melting in the heat of a summer in Baltimore. The physicality of the performance—and the dancers—took my breath away. 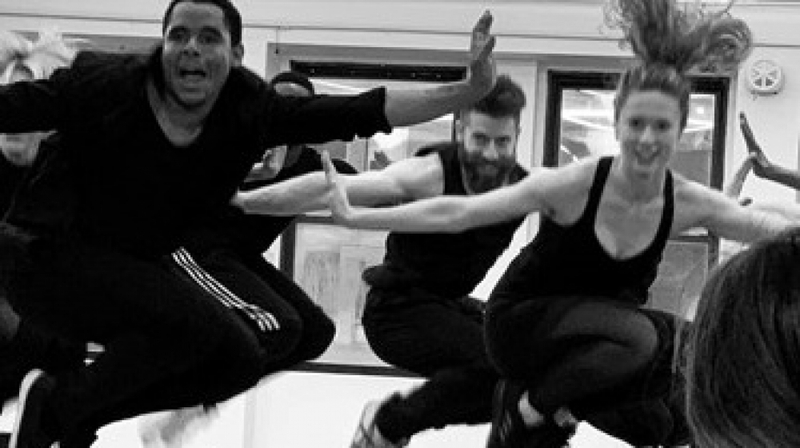 There is one moment in the number where the dancers do 12 consecutive jumps in place, bringing their knees to their chests and maintaining the same level with each other. Just one of these jumps in unison is impressive, but to repeat it several times for us without faltering was amazing. We left the 45-minute rehearsal, all whistling “Too Darn Hot” to ourselves and excited to see the full production when it opens in February. You’re not going to want to miss out on seeing Kiss Me Kate, starring Kelli O’Hara and Will Chase, so beat the rush and book tickets in advance now by clicking the link above.